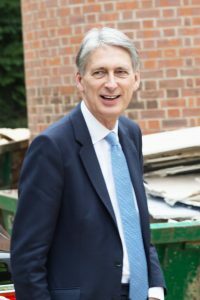 Woking & Sam Beare Hospices received a distinguished visitor on Friday 14th October, when the Chancellor of the Exchequer, Philip Hammond MP, paid a visit to the charities’ new site in Goldsworth Park. MP for Runnymede & Weybridge, Mr Hammond was taken on a tour of the hospice, which is destined to serve his constituency in place of Sam Beare Hospice when the specialist palliative care unit moves out of Weybridge Hospital at the end of the year. Mr Hammond says, “Good Morning”. Accompanied by Chief Executive Officer Nigel Harding, incoming interim CEO Jayne Cooper and Chairman Marc Riggs, the Chancellor started his tour at the new café. The party then moved to the new Wellbeing Centre – a multi-purpose space for day care patients of all ages – before taking a look at the wards housing 20 bedrooms on the first floor, each with a balcony and ensuite. The tour ended in the second floor education suite, which will host training activities. Mr Hammond said: “I am very impressed with the way the original building has been innovatively reworked to save costs and I am pleased to see how the new hospice is taking shape. There is great potential in the improved Wellbeing Centre and education suite and all of the bedrooms are a very generous size. From the new Hospice, the clinical teams will be able to deliver an even better level of specialist end of life care to residents within my constituency for many more generations to come”. VISIT www.wsbhospices.co.uk/NewBuild to find out more about the progress.